NEW PATTERNS: A BLUE MOON FIBER ARTS EXTRAVAGANZA! This has been a banner week here at The Unapologetic Knitter. For the first time ever, I’ve released 4 patterns… FOUR! It was insanity! It wasn’t planned to go down this way, I assure you, but with one timeline or another changing, this is how it all shook out. The funniest (saddest?) bit about all of this is that 3 of the 4 patterns have been in the works for over a year… but I digress! The original 4-panel Back on Track shawl (red) was a labor of love; I knit the over-sized wrap/shawl/poncho shortly after relocating to Oregon as we rented a home while we searched for our “forever” home. It was my first time using Blue Moon Fiber Arts and I became an instant fan! The drape from the silk in the Polworth/Silk blend is pretty dang dreamy, and my oh my is it warm! It’s my favorite going-to-the-farmers-market accessory! 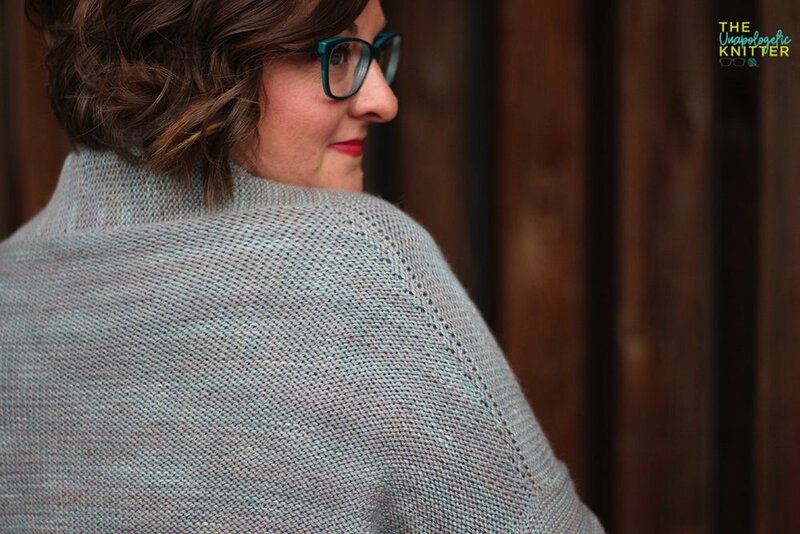 The newer 2-panel Back on Track shawl is traditional in its triangular shape but generous enough in size that it can easily wrap around and create an oversized cowl look. I'm pretty sure I wouldn’t be able to choose a favorite between these two! And today’s second offering is a design I’ve had in mind for quite a few years but not one I ever felt brave enough to try until Tina, of BMFA, said she also loved it. A little support goes a long way! This drop-shoulder cardigan is this knitters dream come true - there’s almost no finishing (save for a tiny seam at the back of the collar and up the sides of the pockets) and is dress-up and dress-down-able on a whim! I will wear this to the grocery store, on my sofa while I knit, and probably any chance I get in the transitional seasons over summer dresses. Wanna save on these patterns? Now through end of day Sunday, February 17th, you can save 10% off on Ravelry using TUKLUVSBMFA on either of these patterns. Plus, since I do really love BMFA, I’m offering 10% off my other designs featuring their yarn: Cabin Rose Cowl and the White Hart Socks. The same promo code will save you 10% off at checkout on Ravelry!